This project is by far one of my personal favorites! This piece was made for a friend of mine who wanted to give his girlfriend a thoughtful gift for her birthday. He told me that she loved the moon and clouds. Where I went from there was to draw him a pattern he would fall in love with. I continue to draw all patterns and perfect them until I know for sure that my client doesn't think it can get any better! All of my clients give me an idea of what they are looking to have made. From their idea I come up with patterns and sketches to fit their needs. In every piece you will get a bit of my own personal style. It can be a very small part, or a large part, but it will be there. 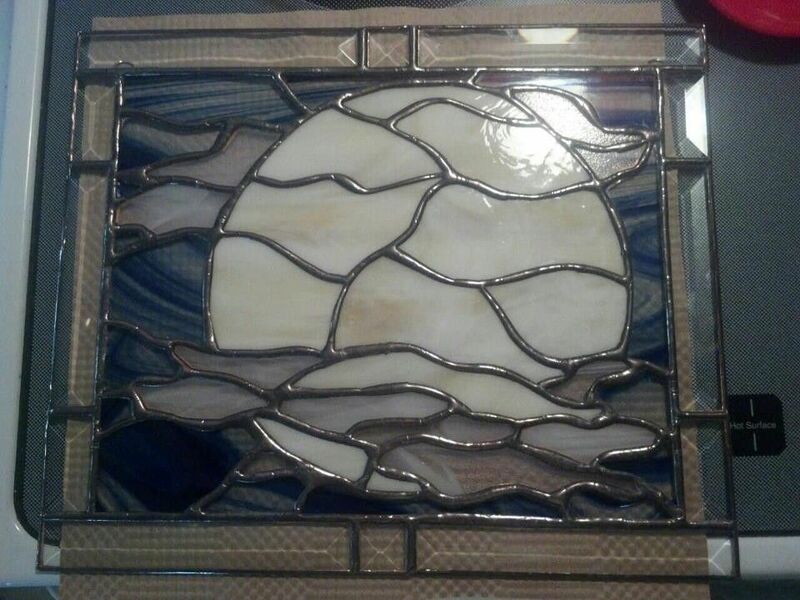 In this piece specifically it is the blue glass that I chose for the night sky. I love the baroque blue glass. Also, I chose the clear so that it can be hung in a window to show off the gorgeous colored glass as well as the bevels surrounding the piece. This piece is 100% custom and one of a kind. I would willing make another similar, but not the exact same. If my client asks me to make a piece that is one of a kind I will not replicate it. This is to ensure that they have the one of a kind feel forever. It really becomes of value to them the way many other belongings can not.